The main building originated as two, or possibly three, cottages. 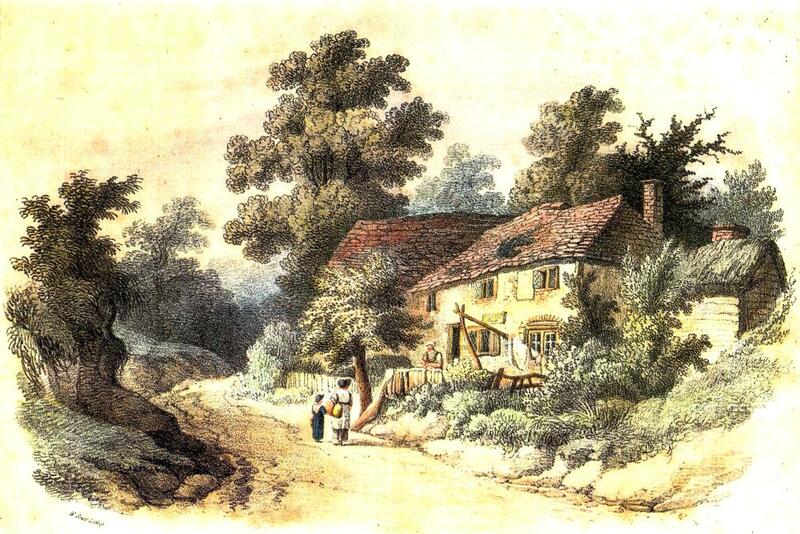 Its use as a public house probably dates from the early 1800s and it is listed as ‘Shepherd & Dog’ in the 1841 census. It seems safe to assume that it derived its name from the annual sheep washing that took place in the stream immediately outside as described by Nathaniel Paine Blaker in his memoir of a childhood in Fulking in the middle of the nineteenth century. As he records, the pub played a key role in this event since it was the place the shepherds went to recover after spending hours in the bitterly cold water. 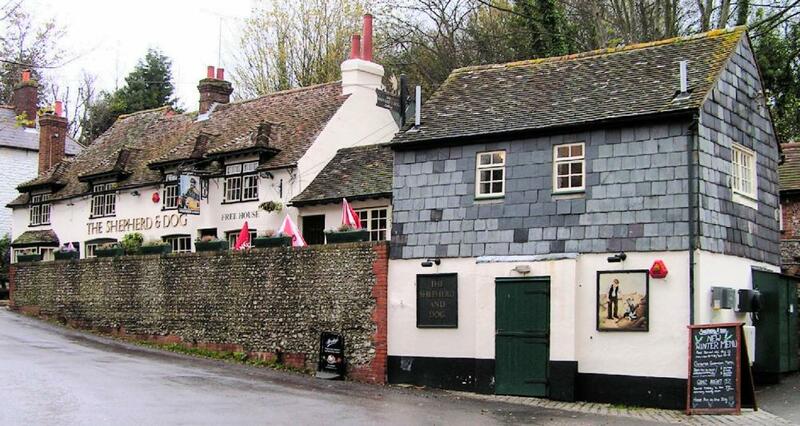 Sussex was renowned for smuggling in the early nineteenth century (Blaker has a brief chapter on the topic) and the pub was used to store contraband. It seems that the goods were first taken up the outside steps and then lowered through a concealed opening into a large cavity below. The location of this hiding place is not currently known, although there is anecdotal evidence that it may have been incorporated in structural changes made to the pub over the course of time. A reporter from a local newspaper is thought to have been shown it in 1927, so there may still be a large chamber waiting to be found — complete with a keg of brandy. In 1841, William and Frances Welling were living at the Shepherd and Dog with their two children and a twelve year old female servant. The census lists William as a bricklayer so it is possible that Frances ran the pub. 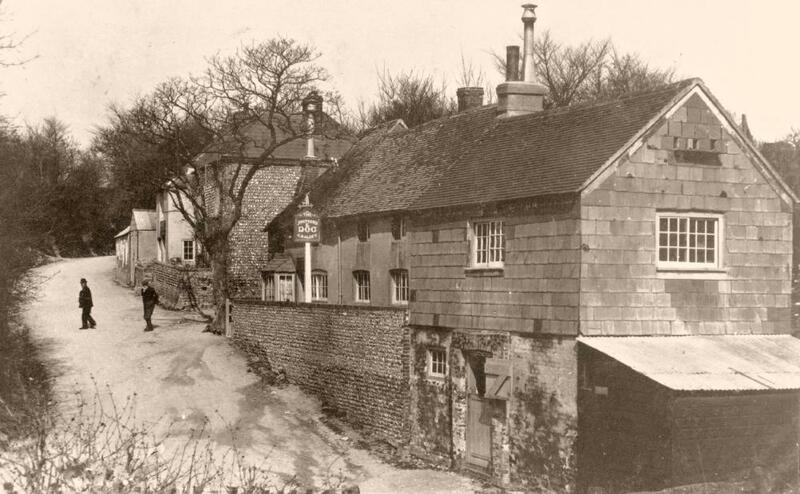 By 1851, the pub had passed into the hands of James and Susannah Strivens (aka Strevens) who were living there with their four children and a fourteen year old female servant. Members of the Strivens family had been living in the parish since the eighteenth century, and possibly earlier. James was born in Fulking and is listed as ‘victualler’ (i.e., the publican). By 1861, their family has doubled in size. In 1871, there are four sons still living at home and working as agricultural labourers. James died at the end of that year, aged 49, and Susannah took over as publican. In 1881, one of her daughters is working there as a barmaid and there are also two sons still living at home Frank, a butcher, and Arthur, a market gardener. It may well be that the relevant market garden was part of the property of the pub. By 1891, Frank has taken over the pub and is living there with his wife Louisa and two infant children. Also resident is a niece from Portsmouth working as a barmaid and a fourteen year old female domestic servant. The records show that, in 1925, the Shepherd and Dog was a quiet place, used mainly by the villagers, with a very large and productive vegetable garden at the back that stretched up to the foot of the Downs. Beer was delivered in a horse and cart by Nobby Richards, who later lived at 23 Clappers Lane. It was not unusual for some of the local lads to ‘borrow’ the odd bottle of beer whilst Nobby was busy unloading. 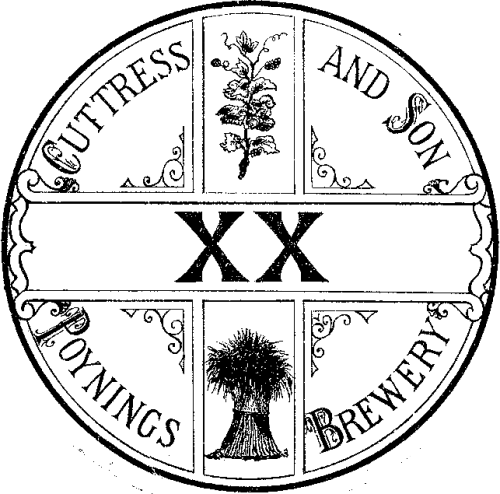 At that time, the beer itself came from the brewery at Poynings which had been opened in 1851 by Samuel Gumbrell, run by members of the Cuttress family, many of whom lived in Fulking or Edburton, for seventy years from 1855, and then, for the period 1925-1940, became Molesworth’s Poynings Brewery Ltd (Holtham 2004, page 8). During the 1930s, the landlord was Eugene Baldey, whose father was known for running a rather dubious shoot and who was often seen selling game or rabbits at the back of the pub. The pub in those days consisted of two bars: the public and the saloon. The public bar had sawdust on the floor as the farm workers and locals usually came in wearing muddy shoes or boots. The saloon bar was carpeted and used by visitors and the local gentry. It was separated from the public bar by a wall with a serving hatch in it. All drinks were dispensed from the public bar and when someone in the saloon wanted a drink they knocked on the hatch, placed their order and it would then be passed through to them. It was often the case that the same drink in the saloon bar cost a penny more than in the public bar. Lemonade was made on the premises up to 1939, a practice that was resumed for a while after the end of WWII, and the pub’s own cider was legendary. Along with this, children could go to a small window beside the front door, known as the Bottle and Jug and buy a biscuit for a halfpenny. In the 1930s, the young Geoffrey Harris used to buy ten Gold Flake cigarettes for his father, Henry Harris, from the window. These cost sixpence and the kindly landlord would always give him a chocolate biscuit. The landlord throughout World War II was Jack Wiseman. During the war, the pub’s trade was reduced to a handful of local people, along with a few Land Army girls and Canadian soldiers billeted in Fulking and Poynings and some British soldiers stationed at Devil’s Dyke and Edburton. For the entire war, Jack was stationed at the King Alfred in Hove, then a training station for naval officers, in charge of naval transport, a position that entitled him to a special petrol allowance and enabled him to return to the pub every evening, often in the company of naval officers who would return with him the following morning. This was a time when bartering and shady black market deals were carried out in many pubs and there were tales of young ladies prepared to grant certain favours to Canadian and American troops in exchange for a pair of nylon stockings, the latter being almost impossible to obtain during the austere wartime conditions. After the war Captain Cyril Watts, a Canadian Officer who had been previously billeted in the village for the D Day Invasion, returned to the village and took over as landlord, assisted by his wife Kay and sister-in-law Joyce. Cyril was a colourful character. There are stories of him leaning out of one of the upper windows on occasions clad only in pyjamas, shouting at the full moon. Another time, having discovered his wife was having an affair, he hung from an upstairs window until he fell although, as it turns out, he did not injure himself. This was considered to be sufficiently noteworthy to be reported in the News of the World. Later, he was accused of bigamy. 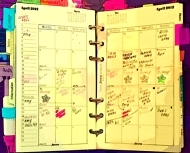 The Times and featured in the newspaper’s calendar the following year. In the 1940s and 1950s, like many country pubs, the Shepherd and Dog was the focal point for local social activities including a darts and a very successful clay pigeon shooting club. 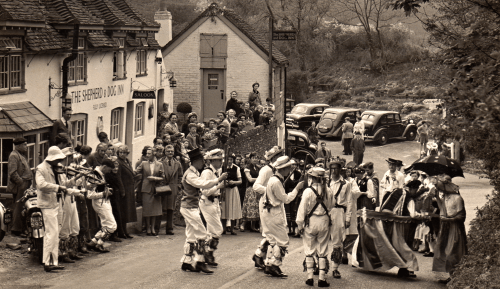 Film shows were featured, children’s Christmas parties were held there and Morris dancing, a regular attraction from 1945, continued up until 2001. 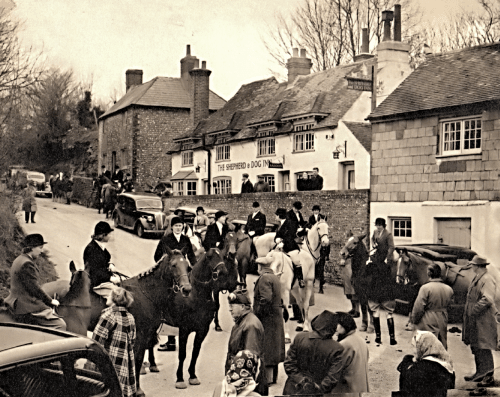 The Hunt Meet outside the Shepherd and Dog in 1946. They used to meet there every year but an anti-hunting landlord later discouraged it and the hunt moved to the Royal Oak in Poynings where the meet has become a well established tradition. Before and after the war, up to the 1950s, cream teas were served in the pub gardens when the weather was fine and if it rained, they were served in a green tin shed where the modern brick kitchen now stands. After the floor of the shed collapsed, teas were served in the pub where the dining area is now. With the war now in the past, trade started to improve and the Shepherd and Dog began to grow in popularity. Bob Champion became the next landlord and was known to the locals as ‘Captain Bird’s Eye’ because of his very large, bushy beard. 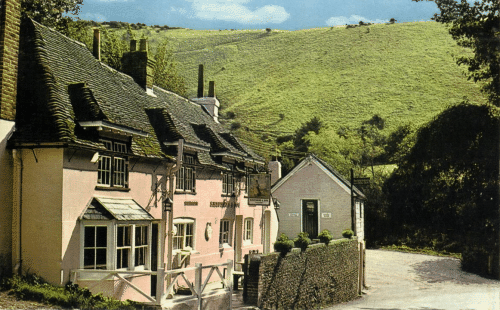 During the 1950s and into the 1960s, Bill Hollingdale, the village poet and a well known local character, would often recite poetry in the pub for entertainment. The cue for his party-piece was when a young man came into the pub with his girlfriend. Bill would lose no time in making himself known to the couple and on finding out the young lady’s name, he would then quickly adapt a suitable piece of poetry to include it and then recite it to her in a very loud voice to a now silent pub. Being flattered by this attention the girl would insist that her boyfriend should at least buy Bill a pint. He earned quite a few pints this way. In 1964 Bob Cruickshank–Smith and his wife Ruby took over as landlords and, in 1965, invited Geoffrey Harris’s firm Springs Smoked Salmon to start serving cold lunches with salad, offering a choice of smoked salmon, trout, pheasant, partridge, and chicken. This was highly successful but had to be discontinued the following year as the main smoked salmon business was expanding so fast they were unable to maintain a regular supply to the pub. By now the structure of the brewery industry was starting to change. Small, privately owned pubs were gradually being bought up and combined into small groups, usually by a brewery, which meant that landlords were now tenants rather than freeholders. 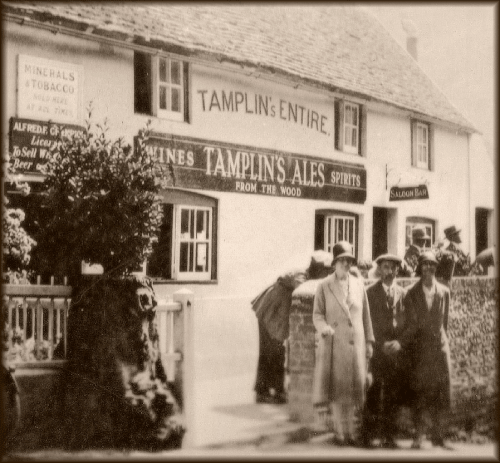 The Shepherd and Dog became part of these changes and when Tamplins brewery bought it, Bob and Ruby moved on. Stan Liquorish took over until the mid 1970s with his wife Joan. He was a popular and successful landlord whose deputy, Stan Taylor, later became the landlord of The Plough at Henfield. 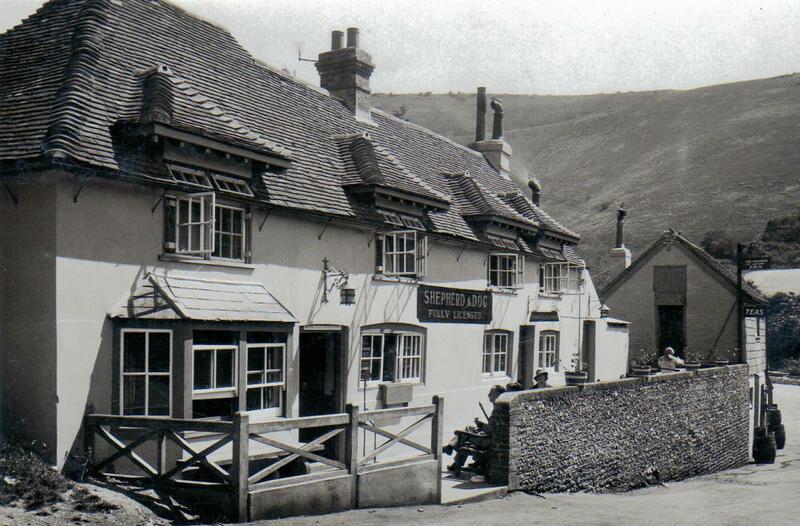 From the mid 1970s until the 1990s, Tony Bradley-Hole took over the Shepherd and Dog. In 1978, at the time of the Queen’s Silver Jubilee, a fancy dress parade for children took place along The Street in Fulking, finishing with a tea party for the entire village in the pub car park, hosted by the Bradley-Holes. Later that year the pub also organised a torchlight procession through the village which culminated in a bonfire and firework display, on what is today, the front lawn of Cannonberries on the Poynings Road. Similarly, for the wedding of Prince Charles and Lady Diana Spencer, the pub offered breakfast to start the day. Villagers then went home to watch the ceremony on television and returned to the pub afterwards for food, drink and a celebration that lasted until midnight. Tony Bradley-Hole was followed by a succession of landlords and during this time it seemed that as soon as a new landlord had built up a good reputation for food, service and a warm welcome at the Shepherd and Dog, the lease would be sold on. There would then follow a slight fall in the pub’s popularity while the next landlord, possibly with a different approach to the business, built up trade again. In January 2006, Geoff Moseley and Jenny Tooley purchased the lease of the pub from Badger, an independent family brewery operated by Hall and Woodhouse, and initiated a major refurbishment. The Shepherd and Dog comprises two Grade II listed buildings. The main building is timber framed, has two storeys wholly faced with stucco, sits on a chalk terrace above the road, and dates from the seventeenth century or earlier. It has a hipped tile roof and casement windows, a bay window on the ground floor, and four hipped dormers on the first floor. The dormers are twentieth century and date from the interwar years. The adjacent stables also has two storeys and casement windows but dates from the eighteenth century. The first floor is slate hung and the ground floor stucco. Nathaniel Paine Blaker (1919) Sussex in Bygone Days. Hove: Combridges. Peter Holtham (2004) “The brewers of West Sussex”. Sussex Industrial History 34, 2-11, PDF. This entry was posted in Food & Drink, Listed Building, Local History, Poynings, Shepherd and Dog, Social, Sport and Recreation. Bookmark the permalink.